If you’re interested in equestrian sports, then you need to put Tryon International Equestrian Center (TIEC) on your bucket list. This premier year-round riding facility attracts horse lovers and equestrian athletes from all over the world! The center is considered the birthplace of modern showjumping. When you visit, you can watch some of the top riders compete in Hunter/Jumper, Dressage, and Eventing disciplines. TIEC also offers free horse shows, festivals, concerts, shopping, dining, and tons of family fun. Here’s why you need to plan a visit! 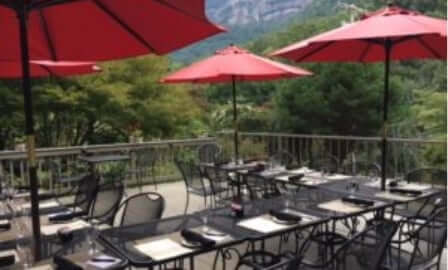 Make sure to get our complimentary Vacation Guide for a complete list of activities, events, and attractions in Chimney Rock and Asheville, NC. It’s full of local tips about the best things to see and do near Tryon International Equestrian Center! The Tryon International Equestrian Center is in the rolling foothills of Mill Spring, NC, and hosts some of the most talented athletes and horses in the nation. The facility, which opened in 2014, includes a 6,000-seat outdoor stadium, 850 permanent stalls, 10 riding arenas, and multiple shops and restaurants. Over the next few years, the $100 million Tryon Resort is expected to expand further. The facility is open 365 days a year, and horse shows are held from spring until fall. 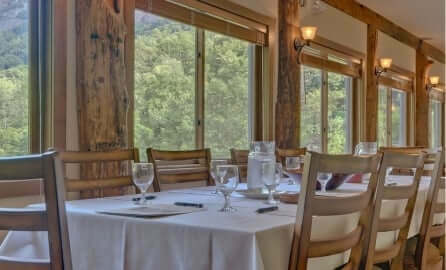 It is just a short drive from The Esmeralda Inn and approximately 45 minutes from Asheville. Second only to the Olympics, Tryon served as the host for last year’s FEI World Equestrian Games. Tryon provides the best equestrian amenities whether it’s for a free show or the World Games. Horse shows and many of the events at TIEC are free of charge, so make sure to bring your family and friends. Free parking is also provided on showgrounds. The Hunter/Jumper shows are held Wednesday through Sunday each week and run from 8 a.m. until 5 p.m.
We’re not horsing around. While you’re enjoying the shows, book a Mountain Adventure Package through The Esmeralda Inn. The excursion includes a two-hour horseback riding trip, a picnic for two, and dinner. In addition to free horse shows, you can attend a variety of family-friendly events and festivals throughout the year. From movie nights and comedy shows to concerts and craft beer festivals, there is something for everyone. You definitely won’t want to miss out on “Saturday Night Lights,” a Grand Prix equestrian event with food, live music, and the top level of show jumping. Whether you are craving sushi, pizza, or Italian cuisine, there are a wide array of dining options to choose from. Grab a steaming cup of coffee at Mane St. Coffee, order a sandwich to-go at the Pony Express, or enjoy a sit-down meal on the patio at the Legends Grille. Then, take the kids for homemade ice cream at the on-site General Store. Most restaurants are open seven days a week for lunch and dinner. When you browse through the shops at TIEC, you’ll find everything from the top equestrian brands to jewelry, gifts, and clothing. Many of the shops also carry antiques, fine art, and toys. Stop into Tryon Tack for equestrian gear, helmets, boots, Tryon logo apparel, and Breyer horses for the kids. 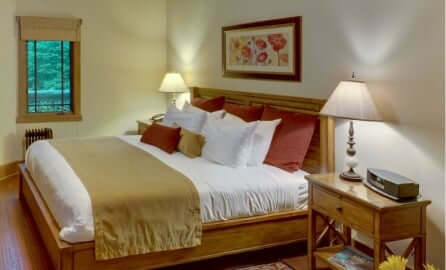 After a fun day at Tryon International Equestrian Center, we invite you to come relax and unwind at The Esmeralda Inn. Our rustic bed and breakfast is a 30-minute drive from the showgrounds and offers the ideal accommodations for your stay. 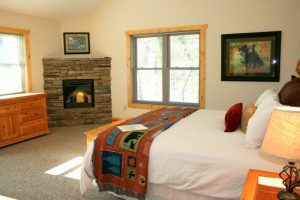 Each of our comfortable guest rooms and cabins features top-notch amenities and spectacular views. No matter which of our lodging options you choose, we guarantee that your Carolina mountain getaway will be one for the books! You can expect to start off each morning with a complimentary hot breakfast to send you on your way. Then, in the evening, join us for a meal at our on-site restaurant and tell us all about your experience at Tryon International Equestrian Center. 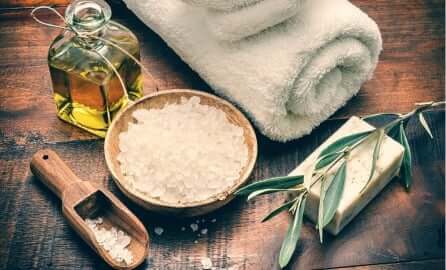 Other on-site amenities include our bubbling hot tub, on-site spa, recreation area, outdoor patio, and more. Check our availability and book your stay today. We can’t wait to welcome you!